Let us show you firsthand how we have earned the flawless reputation we have since first launching the business. With well over 15 years of industry related experience behind the husband and wife team that founded this company, you can rest assured you are getting the best in the business. We truly care as much about keeping your carpets, fabrics and other flooring surfaces clean in your home, as you do yourself. So contact us today to find our about what we have to offer. Part of keeping your home sparkling clean is by choosing the right cleaning professionals to take care of the job for you. Yet it is about more than just carpets, the TruRenew Clean team can also take care of tile, wood, furniture, drapery and more. And it all starts by you contacting us to get your free quote. We care about helping you keep your home looking good but also making sure it is a clean and safe place for you and your family. Carpet cleaning and ongoing maintenance is essential for making your home look good but also about keeping it a healthy and safe environment for you, your loved ones and even your pets. Simple vacuuming just doesn't get the job done. And the store-bought products you get over the counter are just not as effective and can even end up causing damage to your carpet fibers. Get the thorough clean that rids your flooring of dust, spots and even expert level pet stain and odor remediation. Your wood floors are one of the smartest improvements and best investments you can make for your home. Of course with this type of flooring comes the need to take good care of it yet the time it would take to do so can be too much. Not to mention, the products you can purchase in your local home improvement store can do more harm than good. Let the TruRenew Clean crew take care of helping you protect your wood floors. Your furniture is an investment you should be able to keep for years, even decades, to come; possibly even to become a family heirloom passed from one generation to the next. Yet spills, wear and tear, natural aging and even dust can compromise the overall condition. Caring for upholstery is part of making sure you can prolong the lifespan of your furniture. Let us be the name you trust in for caring for your upholstery and fabric surfaces. Tile floors and surfaces can be a wonderful asset to any home, as long as it is properly cared for. Without professional cleaning, the grout can collect mildew, mold and bacteria, nothing simple mopping can easily take care of. Once any of these harmful substances can permeate the surface they can quickly take hold and begin to break it down. We can help prevent this by helping you keep your tile surfaces clean and protect you and your family from things like bacteria that can potentially collect here. TruRenew Clean is proud and honored to already have earned the impeccable reputation we have. Unlike most of the other carpet cleaning companies, TruRenew Clean does not offer franchise or use contractors for our services, we train and motivate our staff internally. We also take great pride in the fact that we do not use high pressure sales tactics on our customer base; we employ an educational approach to demonstrate to our customers the value and benefits they receive for the work we do. It is also the goal of our team to use state of the art equipment and cleaning solutions to get the most effective results without causing any potential harm to the carpet, fabric or other surface material we are working with. You can also rest assured that our prices do not change throughout the year, nor do they vary depending on location from one neighborhood or city to the next. Contact us today so we can set up an appointment time for your free quote. 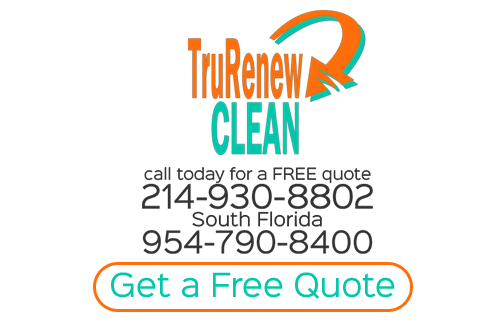 If you are looking for any of the TruRenew Clean Services then please call 214-930-8802 or complete our online request form.